Bring a 15" laptop, a 10" tablet, accessories, and personal gear on your next trip with the black Peak Design Traveling Kit put together by B&H. 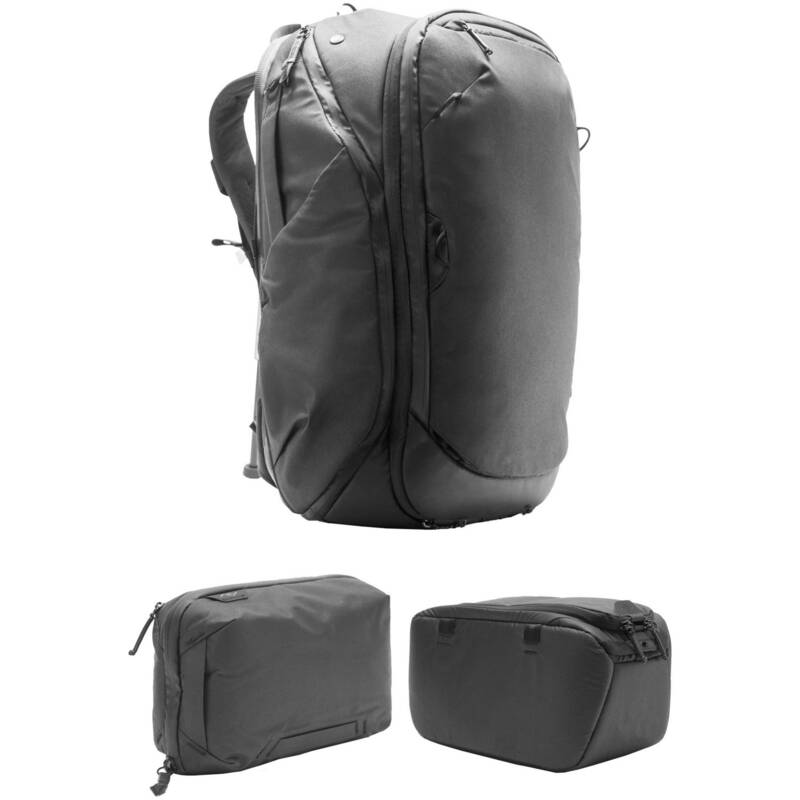 The kit features a 30 to 45L, versatile, multi-configuration backpack, with rear, front, and side access. An open interior layout facilitates a compartment storage approach. Matched with the pack are a Travel Tech Pouch and Travel Camera Cube. Together, these three items provide numerous travel options. This small Travel Camera Cube from Peak Design is part of a compartment system that enhances the ability to organize the contents of a Peak Design Travel-Series bag. Specifically designed to store camera, video, audio, or digital media equipment, it can accommodate a DSLR camera with a battery grip and a 70-200mm f/2.8 lens, or a mirrorless camera and four lenses, or a medium-sized folding drone kit. Equipment placed within this Travel Camera Cube's non-abrasive interior can be arranged using its two padded, touch-tab dividers. A movable, touch-tab pocket is also provided to hold batteries, memory cards, or other small accessories against the inside of this Travel Camera Cube. When placing the Travel Camera Cube itself within a compatible Travel-Series bag, four included Peak Design C-Clips allow it to become a securely mounted compartment. The Travel Camera Cube is then prevented from shifting, and can be made to have its zippered opening align with one of a Travel-Series bag's own openings for seamless accessibility to the equipment inside. Complete access to the Travel Camera Cube's interior is enabled by a zippered panel. A pull-tab along the top of the zippered panel can be used to simultaneously retract the zippers while opening the panel for immediate removal or placement of items within the Travel Camera Cube. While intended to be used as an internal Travel-Series bag compartment, this Travel Camera Cube features durable, weather-resistant nylon construction, and a top handle allows it to be securely carried. Box Dimensions (LxWxH) 14.5 x 10.5 x 7.1"